The newest restaurant on Medan Damansara's Kasah row seeks to stand out with a menu of elaborate recipes that showcase admirable ambition, even if the food isn't complemented by the bar-like setting with less than comfortably high tables & chairs. We have to offer a measure of support for any kitchen that tries to tackle a complicated concoction like ginger-cured hiramasa kingfish sashimi with prawn remoulade, kaffir lime & wonton chips (RM32 before taxes). Seared sea scallops with cauliflower puree, Chinese sausage crumbs, Asian coleslaw & yakitori sauce (RM36). 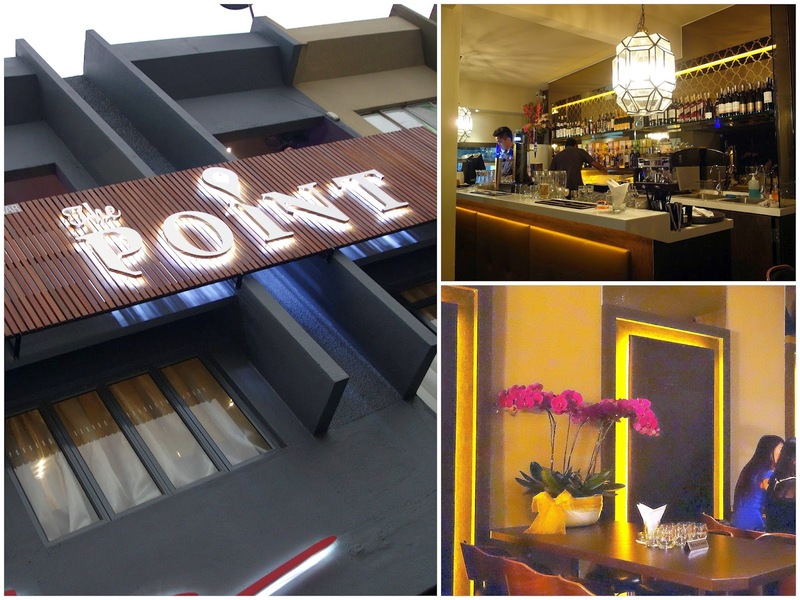 The Point's menu nicely balances Western & Eastern flavours in thoughtfully textured preparations. Even the pub grub displays a degree of difficulty that's appreciably high, evidenced by The Point's signature Scotch eggs (RM10), fresh & runny _ not cold & thoroughly boiled _ wrapped in pork mince & bacon, served with chilli-caramel sauce. The tapas selection is diverse; this skilfully executed soft-shell crab mini-burger with Sriracha mayo (RM12) could prove popular. Chicken isn't mundane at The Point: Sous-vide fowl meat with celery ribbons, confit cherry tomatoes, house-made bacon jam & lemongrass sauce (RM40). The chicken could be even juicier, but the sum of these components still works effectively enough. Twice-cooked duck leg with mixed mushrooms & braised onions & carrots in soy broth (RM38). 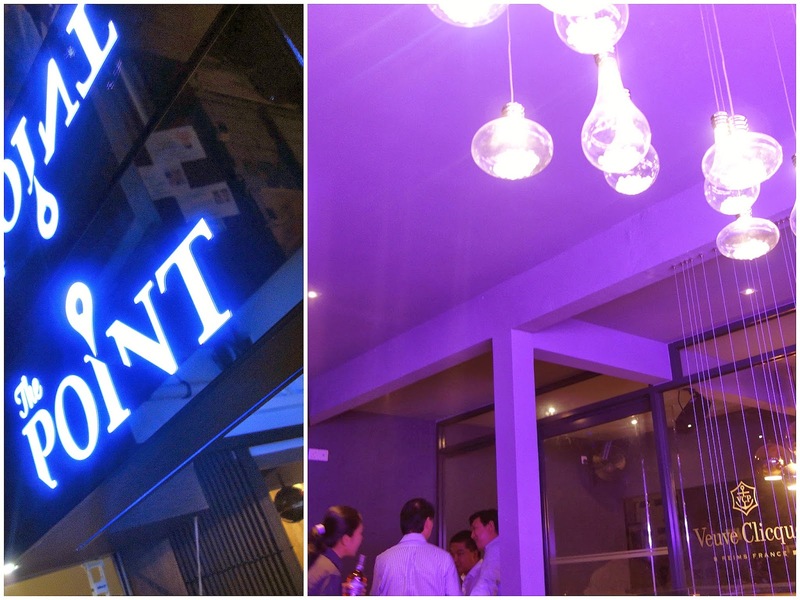 All in all, The Point is a welcome entry to KL's F&B scene, mainly because we do like the direction toward which its chef seems to be striving. Ooooo...duck! Yum! Yum! I've never tried Scotch eggs before - I'm sure I'd love it. I love all eggs!!! Oops!!! LOL!!! The decor is crisp and clean...and the duck leg dish looks really sumptuous! Sashimi and scallop, these are in my to-eat-list! Hehehe. I also like the first two dishes - the hiramasa and scallops! I don't mind bar stool eating as long as the food is good. I like all the dishes, looks very nice, except for the twice cooked duck. It could be just my prejudices though, but does the texture taste alright? I've seen people butcher this dish by making the skin soggy instead of crispy. The other dishes look absolutely spot on though! It's certainly very complex with lots of techniques, from your description too! wah not bad huh they can make scotch eggs with a runny yolk. I am trying to make the same thing here too one day. Runny scotch eggs? The scots would wage war if they knew!